Sara is the Small Group Coordinator here at UUMC, and is passionate about helping build authentic connections in our community. She grew up in The-middle-of-nowhere, Alaska, and although she misses the mountains from time to time, Indiana has definitely become home. Sara's an '09 Taylor grad with a BA in Psychology and works at Tree of Life in Marion. In her free time, she's a freelance costume designer and loves all things theatre. On the weekend you might find her drinking coffee with pals, smelling candles at Anthropologie, or curled up on her couch watching Netflix. Kevin is the director of children's ministry here at Upland UMC. Unless you have children, he's the staff member you never see because he is always with the kiddos in the basement. He grew up just outside of Cincinnati (…that explains the Bengals stuff…) and is married to the former Kate Crawford. They are the proud parents of Kendall, Keira, and Kassidy. They aren't just all "K" names, but also "KLD" initials! Kevin is a 2010 graduate of Indiana Wesleyan University with a bachelor's degree in education, holding Indiana teaching licenses in both physical education and science, but is living out his ministerial calling by using a variety of skills in his role at UUMC. Rob is the Sr. Pastor of UUMC with a passion to preach the Word. He and his wife Tammy have been married since 1984 and have 3 adult kids...Sarah, Esther and David. He loves competition, especially through Fantasy Football and acquiring more friends than his kids on Facebook. He also spends a lot of time dreaming of his "retirement" in Hawaii! 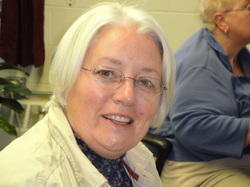 Tammy is the project manager for the Pierce Project - the future location for the Upland United Methodist Church. In her spare time, she loves entertaining, cooking, gardening, antiquing, camping & traveling. In her spare time, she creates items from vintage linens for her etsy business Second Fiddle www.etsy.com/shop/playingsecondfiddle. Tammy is married to Rob (see above!) and isn't quite as keen on retiring in Hawaii as he is!! Sherry is our "Air Traffic Controller" here at Upland UMC. She keeps us all headed north, manages our calendars and makes sure the light bills get paid! Sherry and her husband, Mark have been married since 1978. They live in Blackford County and have three adult children. 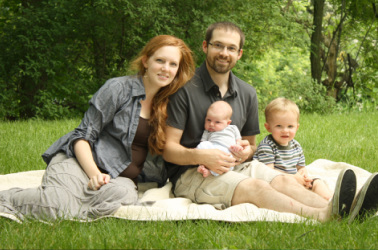 Scott, wife Rachel and their children Lucy and Collin live in Muncie, Kathryn, husband Jeremy and their children Lydia and Joshua from Ft. Wayne and Gregory who lives in Columbia City. In her spare time, Sherry loves to go camping and birdwatching - so don't let the binoculars out the office window alarm you!